When recording observations the last thing you want to be doing is looking down at your device, struggling with typos, entering times. Timestamped Field Notes allows efficient note taking; time-stamping each entry as you make it. Simply tap buttons to record the most commonly recorded events (or most used words), significantly reducing the need for typing. Fallback to the keyboard only when required. Export your notes in chronological order by exporting to cloud storage. Timestamped Field Notes supports timestamps to minutes or to seconds; configurable to display and/or export seconds (although they are always stored in case you change your mind.) Dates and/or Times can be exported. Behavioral Observations - wildlife species. Behavior & Event Recording - observing patients, students, teachers. Personal journal or notes log. 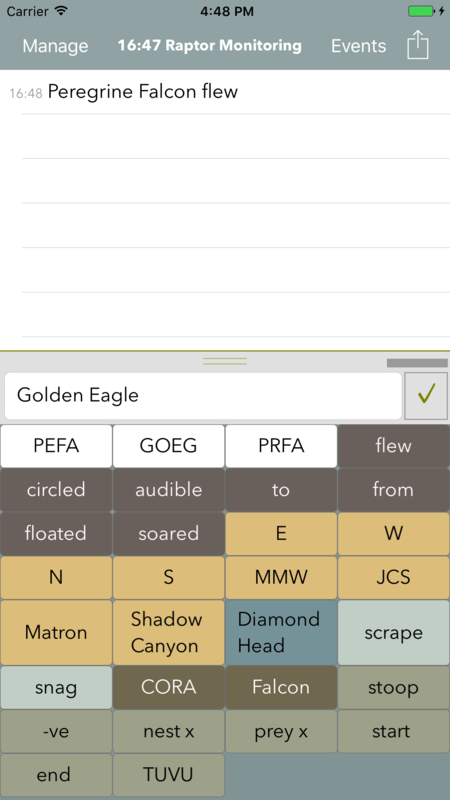 Timestamped Field Notes supports multiple keyword sets, each for separate purposes. View the documentation or frequently asked questions.